It’s the taste of the County Fair in a jello shot with a bit of a kick! In a large glass measuring cup dissolve 1 envelope Knox gelatin in 1 cup of boiling water. Add 1/3 cup of cold water, 1/3 cup of Butterscotch Schnapps , and 1/3 cup of Sour Apple Schnapps. 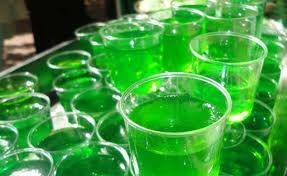 Stir well and cool a little before pouring into jello shot cups and chill. Saw that someone was making these today so I thought it would be a great idea to repost.